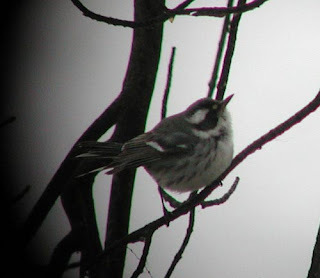 Rick Veldman sent me the following video link on the Black-throated Gray Warbler. The clip was taken Saturday morning, the last day of this bird's life. A few new sighting locations from today- the bird possibly crossed south of Leonard St on at least one occasion, and it also almost reached the north end of the parking lot. At times it disappeared for up to 60-90 minutes, but always reappeared. Here is the most up to date map of its known home range. This morning (Saturday) saw the biggest influx of people to see the warbler yet- at least 25 people as of 11AM. Another 20+ came in the afternoon, and as far as I know everyone was successful. Here is a group from the Detroit area. The bird was discovered at 8:20AM, seen briefly then disappeared heading south along the river. It wasn't refound until nearly 9:45AM, when intrepid birders watching the cattails 200 ft north of Leonard St found it skulking like a Sharp-tailed Sparrow. It them put on a show, heading north through the corridor all the way to the yellow building, then flying over to the pines on the west side of 1345 Monroe, where I snapped my two best shots of the bird in 3 days. The bird still has not found my mealworms, suet or seeds, which are in the platform, and in three or four scrapings I created underneath the bushes, near and just south of the feeders about 20 ft. I also added a pile underneath the box elder next to the dumpster, as the bird has been seen foraging in that tree at least 3 times at length. Well- today at least 10-15 people braved the cold winds to look for the Black-throated Gray Warbler, and nearly all (if not all) were rewarded with at least decent looks. I have embedded an updated map showing the locations of all sightings to date. Also, for the entire morning a Merlin was perched almost directly over the south feeder, which worried us greatly because the slow-flying warbler was often crossing the parking lot by itself, an obvious target. By noon the Merlin had left, fortunately without any paruline meals. As you see in the map, the bird expanded its known home range a bit today, especially on the south end- where it was seen at least 3 times down in the cattails a couple hundred feet north of Leonard St. It also traveled north of the south feeder a hundred feet or so, which it hadn't previously done. Lastly, several of us saw the bird working the "backyard" behind the yellow building, especially along the fence covered in vines and the deciduous 20 ft tree adjacent to the south side of the dumpster. Several times the bird foraged on the ground itself. 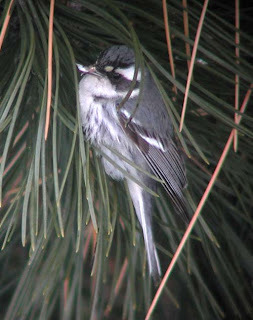 Again, the bird constantly crossed over the parking lot and the building into a red pine on the northeast side of the structure, particularly in the late afternoon (3-4PM), but it also made regular forays throughout the day to the pines on the west of the building, today including a white pine at the sams spot. 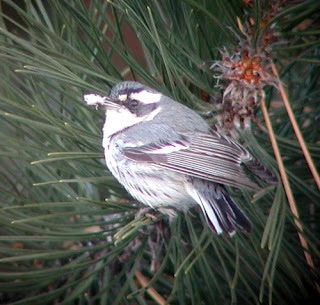 The rest of the time, the bird was mixed in with the chickadees or by itself along the river corridor. Mealworms were laid out for the bird today- in the south (platform) feeder, as well as in 3 holes dug in the snow underneath the bushes near the south feeder. However, it never seemed to find this food. It appears to be subsisting on foliage-gleaned insects, but seems especially successful on the old white pine and red pine cones- where it was seen pulling a large unidentified larva out and beating it to death before consuming it. So, despite the very harsh weather, the bird appears to be holding its own. Several more folks are coming in the morning, so let's hope it continues to survive! 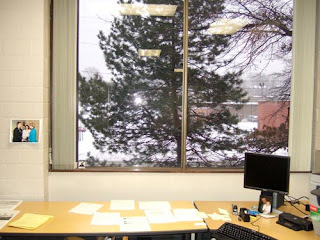 Imagine yourself sitting in this office, talking on the phone, enveloped in the middle of an average January work day. "That's Not a Chickadee" is right. 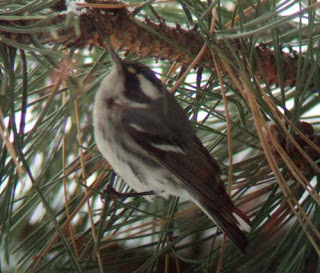 A Black-throated Gray Warbler! In downtown Grand Rapids! After a few expletives, I gathered myself enough to develop a game plan. I decided to watch the bird just long enough to be sure what I was seeing, then sprint for my car, where my camera and scope awaited. Had to get a photo to convince everyone else I was for real. As I got the photgraphic equipment ready, I could still see this little bugger flitting around, high in the tree. Once I was finally ready to shoot, however, he was nowhere to be seen! I could not believe it. I searched anxiously for 2 more hours around the building but was not able to refind this guy. The next morning, I knew that there was still a decent chance this bird was in the area, but I wasn't sure where to look. This bird was, after all, an insect-eater, so it would probably be attracted to open water - bingo! Got it. Maybe it was down along the river? So I began my morning search in the wooded corridor along the banks of the Grand. Soon, I located a flock of chickadees. Hmmm. Getting warmer, I thought. 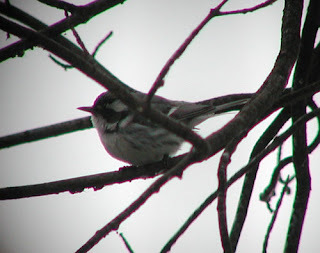 (It is commonly known that migrating and wintering warblers often hang out with chickadee flocks). Within 2 minutes, I had spotted him. Eureka! He was foraging on the branches overhanging the open water of the Grand- vigorously gleaning insects from the branches. Now, the challenge was to get a photo. As luck would have it, my camera decided today would be a good day to break down. The battery compartment door would not hold shut; thus, I had to hold the batteries in by pushing really hard on it. If I let up at all, the camera would shut off. As if digiscoping a hyperactive songbird wasn't hard enough already... Fortunately, although the bird would not sit still for long, it did allow me to follow it for a long time, eventually allowing me to snap several digiscoped shots. It was a major relief to snap these photos, especially after yesterday's frustration of losing the bird seconds before I was ready to snap. 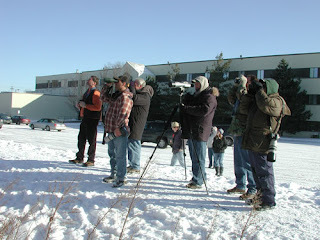 Fortunately, I was able to get the word out to other birders and at least 7 or 8 other local birders were able to come see this bird. Here are two of them. In hindsight, I believe this must be one of the statistically least-likely bird sightings in my entire birding life. 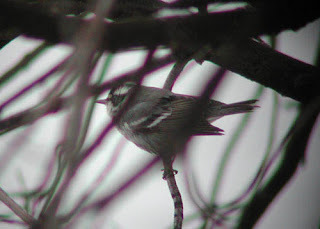 For a western bird with only five recognized Michigan records to show up within our borders is one thing, but to show up in Grand Rapids, and then position itself in the ONLY tree in which I could have seen it, seems astronomically small! I wish some statistician could calculate for me the amount of money which could be won in a lottery with the same luck. I will bet you it's a lot higher than my annual salary. 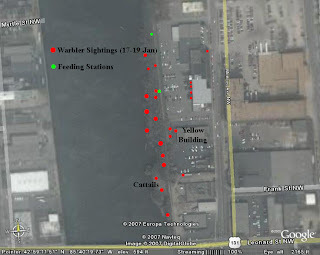 For those planning to try for the Black-throated Gray Warbler in Grand Rapids, here are some helpful specifics. Park behind the building and walk atop the berm overlooking the Grand River. 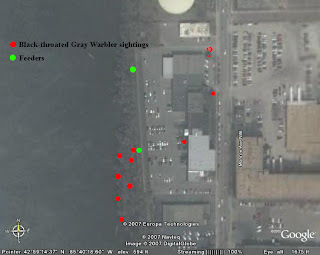 There are two feeders, both placed above the railroad tracks at eye level, one each at the northwest and southwest corners of the parking lot (in green on the map). 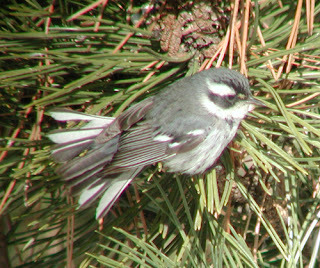 The bird spends the majority of its time associating loosely with a chickadee flock which is usually (but not always) near or south of the south feeder. 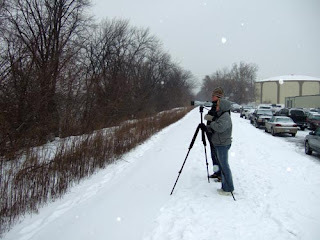 Starting at the south feeder, walk south on the railroad tracks while scanning out toward the river- the bird is often in the branches overhanging the open water. Occasionally the bird makes forays toward the building, foraging mid to high in the canopy of the Red Pines flanking the building. So far I've seen it once in a pine at the west entrance and at least four times in one at the east entrance (this is where I discovered the bird initially as well). 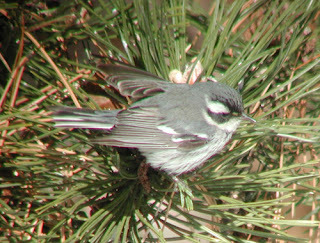 All morning long on 28 Jan the bird was present along the river (between 10AM and 12:30PM), but interestingly in the afternoon (2-4PM), almost all of the sightings were in the pines adjacent to the building, especially the northeast tree. If you come, please consider bringing some mealworms or peanut hearts, and putting them on the platform feeder. With any luck, this bird may stick around all winter.